Attention Deficit Hyperactivity Disorder (ADHD) is a behavioural condition you seem to hear about a lot these days. ADHD can raise many questions for parents. There is a new book out by psychologist Stuart Passmore titled The ADHD Handbook which aims to answer some of these questions. See below for more information about The ADHD Handbook and if you have any questions you might like to visit author Stuart Passmore’s Facebook Page. >>> Readers of my blog can download an exclusive extract from The ADHD Handbook here. Attention Deficit Hyperactivity Disorder (ADHD) is one of the most common childhood disorders right across the world. It is also one of the most misunderstood. Myths that ADHD is caused by sugar or by bad parenting and shrill headlines claiming that the disorder is simply a confection cooked up by big pharma to peddle drugs to kids all add to the confusion. Author and psychologist, Stuart Passmore, says that parents need to understand that ADHD is real. It is a neurological disorder and it can be treated. In his new book The ADHD Handbook, Passmore sets out to give struggling families what they really want: a no-nonsense tool to help them find out what is going on with their children and to discover how they can help them. Drawing on the most up-to-date research from around the world this book presents a comprehensive look at ADHD, covering everything from how it is diagnosed to the common myths surrounding what causes it; from the brain anatomy implicated in the disorder to the pros and cons of the various types of medication, and from the most effective psychotherapies to the best parenting techniques. Amid the emotionally charged debate that surrounds the disorder Passmore points out that ADHD has the potential to negatively impact relationships and academic outcomes. In the longer term sufferers may experience reduced employment prospects and the attendant comorbidity risks of delinquent behaviour, such as substance abuse. For these reasons it is vitally important that parents have access to accurate information which will empower them to help their children be the best they can be. Written in calm, direct and non-judgemental language this book is a must have for any family negotiating the maze of ADHD treatments and lost in the jungle of contradictory and confusing messages. Stuart Passmore is a psychologist in private practice. He has developed an evidenced-based Parent Management Training program for parents of children with behavioural disorders ranging from ADHD to Oppositional Defiance Disorder toConduct Disorder and children with explosive and non-compliant behaviours. Stuart also conducts professional development training workshops on Parent Management Training for behavioural and anxiety disorders. 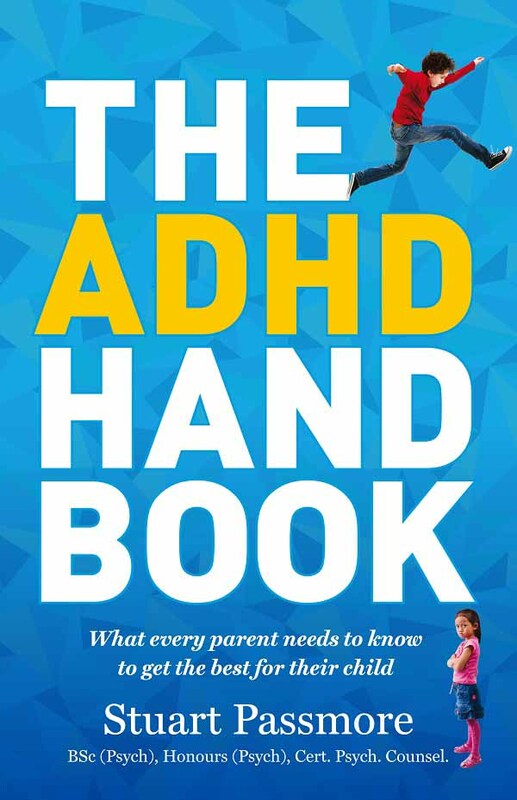 The ADHD Handbook is available May 2014 from www.exislepublishing.com.au and wherever good books are sold. RRP $34.99. Also available as an eBook.